The DTEA1030 series of AC/DC desktop power supplies offers up to 36 watts of output power in a 3.86” x 1.77” x 1.22” package. This series consists of single output models with a wide input voltage range of 100~240VAC. Each model in this series has RoHS compliance and optional CEC compliance as well as over voltage and short circuit protection. 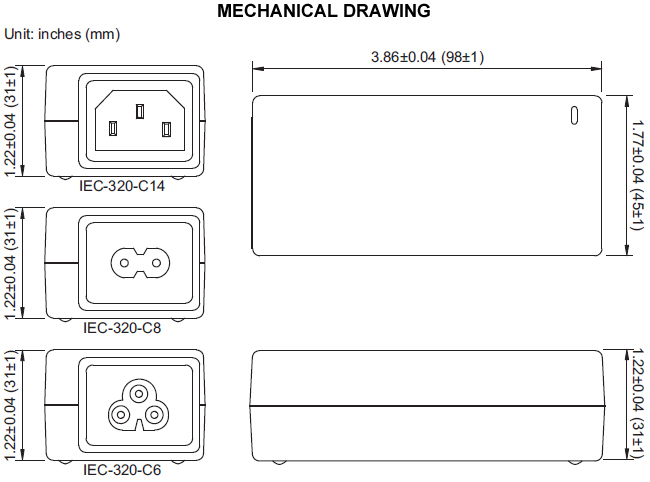 IEC-320-C14, IEC-320-C8, or IEC-320-C6 AC inlets are available. This series has UL/cUL, CB, CE, FCC and CCC safety approvals. Notes: 1. The red suffix represents the type of AC inlet connector: “1” for IEC-320-C14 type, “2” for IEC-320-C8 type, and “3” for IEC-320-C6 type. 2. The output voltage is specified as a range (Ex: 9~12VDC); the customer must specify what they would like the voltage set at. 3. Ripple and Noise is measured at nominal line and full load with 20MHz limited bandwidth and a 0.1µF ceramic and 47µF aluminum capacitors in parallel on the output.